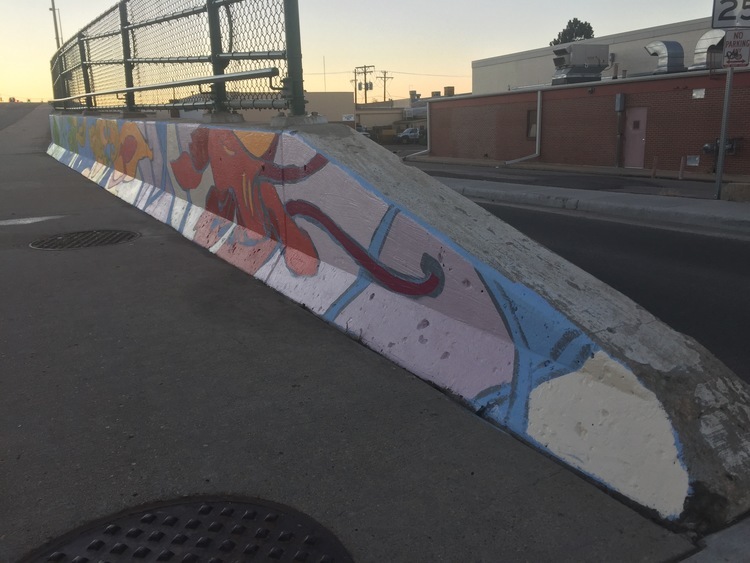 This mural was created at the behest of the Overland Park Neighborhood in Denver. 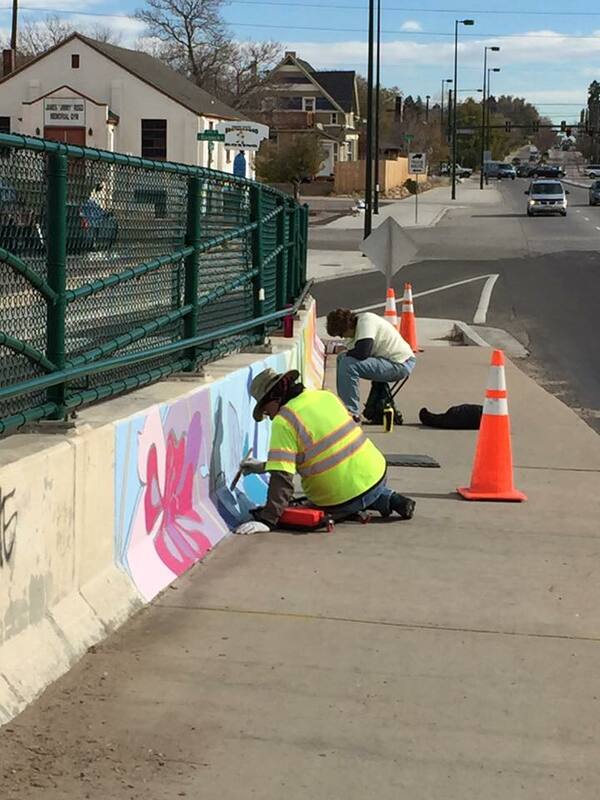 They approached me to help them apply for the Urban Arts Grant with the City of Denver and create a mural to cover the Evans Bridge over Santa Fe with colorful art. 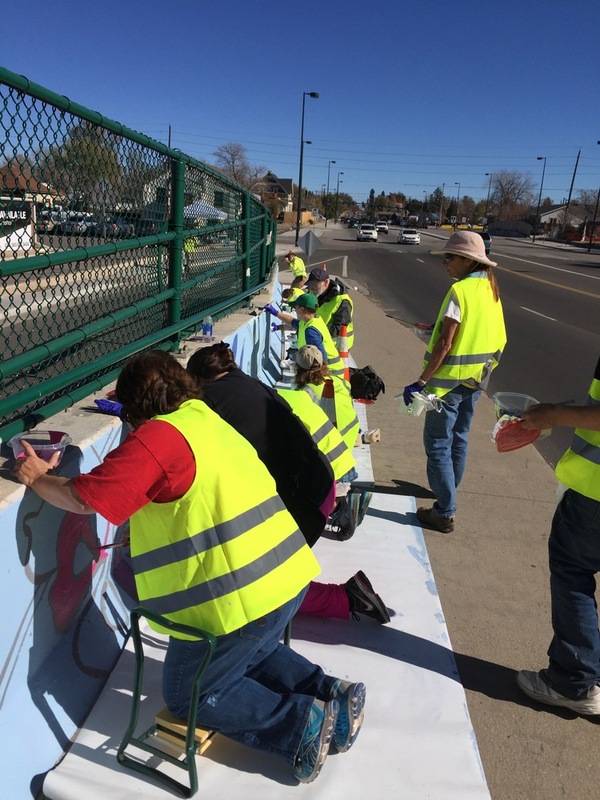 We started the process with the idea of keeping the art simple enough that the neighborhood could actually help paint. This was more than just a mural or a piece of art for Overland Park. This was a way to create a sense of place for the entire neighborhood and to brighten up a dull and industrial bridge in their backyards. To do this, I created a proposal that centered around a “paint-by-number” style of color blocks that could be easily painted by anyone. Keeping the quirky and whimsical style of the neighborhood in mind, I chose a color palette that reflected the range of neighborhood personalities. This detailed color work also helped balance out the simple and clean lines of the design. The three mural themes that were chosen for this design are easily described as the three F’s which are “Fish”, “Flowers”, and “Feet”. 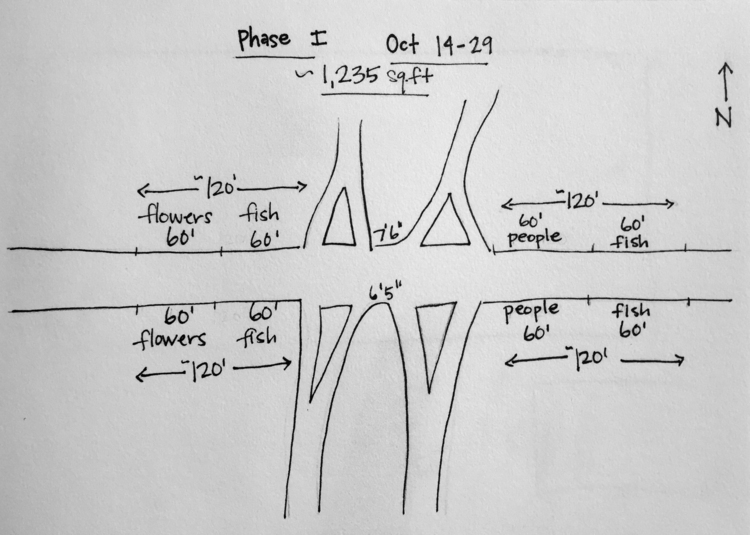 The “Fish” theme is based around the South Platte River which runs through the Overland Park neighborhood and is a major part of their identity. 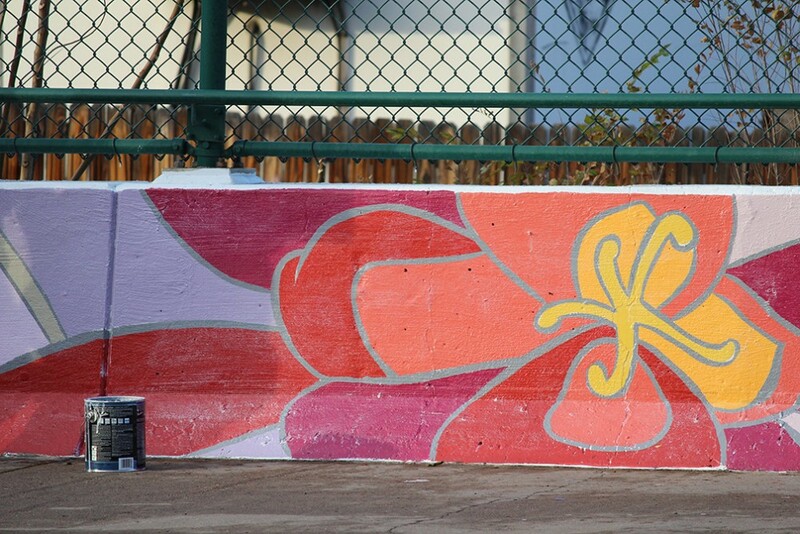 The “Flowers” theme reflects the more regional location of this neighborhood by using the Colorado State flower, the Columbine. The “Feet” theme of this design is the most personal part of the mural as it represents the people who cross the Evans Bridge every day. It is meant to show the wide range and diversity of the people in Overland Park. 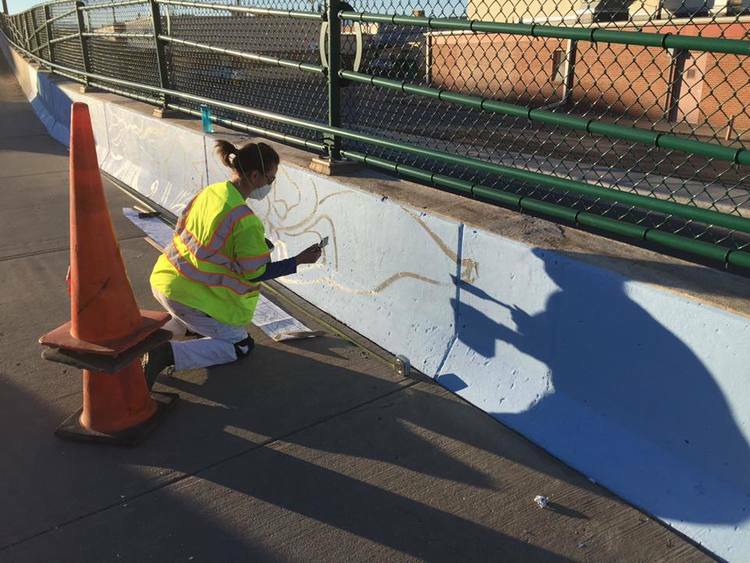 Besides simply decorating the bridge, this mural is also a graffiti prevention measure for a highly tagged area and serves as a traffic calming technique to help cars notice people as they cross this highly trafficked bridge. Check out the Washington Park Profile news article.